Some thief committed identity fraud and stole every penny out of the bank account of America's oldest living veteran, Richard Overton. The good news, though, is that a previously created GoFundMe has already accumulated more than $300,000 to help recoup the losses. 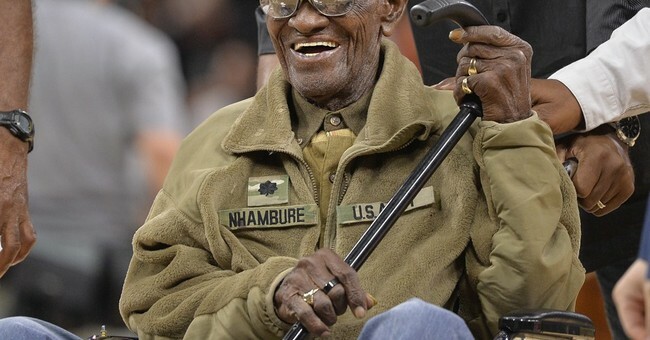 Richard Overton, aged 112, is the oldest living veteran in the United States. His personal information is readily available online, and his family members say that somebody must have taken it to "hack" into his personal bank account and take his life's savings. Someone used his account to purchase savings bonds with Treasury Direct, Richard Overton's cousin Volma Overton Jr. said. He added that the purchases had been happening for a "couple of months." Volma Overton discovered the account discrepancy when he deposited money into Richard Overton's personal account, then went to the bank to check the balance. All that was in there was the money he had just deposited. "I looked at it — what the hell are these debits?" Volma Overton recalled thinking when a bank employee pulled up the statement showing the money went to Treasury Direct. He said the bank has been very helpful and that he's also sent a letter to Treasury Direct. The family has not notified police. But, while the Overtons attempt to track down the thug who stole the World War II veteran's bank account, generous strangers are donating to the GoFundMe established by Overton's family in 2016 to help with the around the clock treatment that he requires. That GoFundMe currently has more than $324,847 and counting. Townhall reported on Overton last December noting that, Overton "has lived in the same house for the past 70 years that he built himself. Overton routinely smokes 12 cigars a day and keeps his whistle wet with a nice cold Coca-Cola and a splash of whiskey."